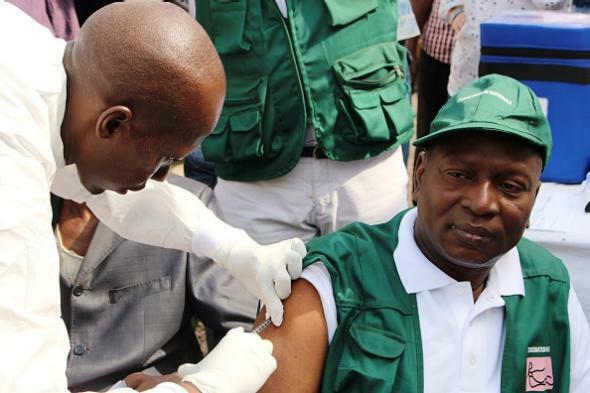 Ebola vaccine: Effective in Guinea trial, World Health Organization says. A man is vaccinated on March 10 at a health center in Conakry, Guinea during the clinical trial of the VSV-EBOV vaccine. Between April 1, 2015, and July 20, 2015, 90 clusters, with a total population of 7651 people were included in the planned interim analysis. 48 of these clusters (4123 people) were randomly assigned to immediate vaccination with rVSV-ZEBOV, and 42 clusters (3528 people) were randomly assigned to delayed vaccination with rVSV-ZEBOV. In the immediate vaccination group, there were no cases of Ebola virus disease with symptom onset at least 10 days after randomisation, whereas in the delayed vaccination group there were 16 cases of Ebola virus disease from seven clusters, showing a vaccine efficacy of 100% (95% CI 74·7–100·0; p=0·0036). No new cases of Ebola virus disease were diagnosed in vaccinees from the immediate or delayed groups from 6 days post-vaccination. The vaccine was developed by the Public Health Agency of Canada and is licensed to the Merck and NewLink companies. There were seven new Ebola cases reported in West Africa in the most recent week for which data is available. More than 11,000 people have died in total from the disease during an outbreak that began last year.